Đức Phật - Đức Phật ở đâu. Người ta luôn hỏi câu này, Phật đã đi đâu và hiện nay ngài đang ở đâu? Đây là một câu hỏi rất khó trả lời cho những ai không có một sự tu tập về đời sống tâm linh. Bởi vì người đời thường nghĩ về cuộc sống theo cách của thế gian. Họ khó có thể hiểu được khái niệm một vị Phật. Vài nhà truyền giáo nào đó tiếp cận các Phật tử và nói rằng Phật không phải là một vị thần mà chỉ là một con người. Ngài đã chết và không còn nữa. Vậy thì làm sao người ta có thể tôn sùng một người cũng đã chết? Những chúng ta phải hiểu rằng, Đức Phật được tôn xưng là Thiên Nhân Sư, vị thầy của chư thiên và loài người. Bất cứ khi nào chư thiên có gặp khó khăn, họ đều gặp ngài để xin lời khuyên. Thế rồi họ nói rằng vị chúa tể của họ vẫn hằng sống, và đó là lý do tại sao người người cầu nguyện với Ngài. According to science it has taken millions of years for us to develop our mind and understanding. When their mind was not fully developed people became aware that there are some powers which make nature work. Because they could not understand how exactly nature works, they began to think there must be a person who creates and maintains these occurrences. To help others understand this concept they transformed this energy into a form and represented it physically as statues and paintings. These “spirits” or powers were important to make humans to do good and not to do bad things and to reward them if they were good. Always we have fear, worry, suspicion, insecurity, so we need someone to depend on for our protection. Eventually this force was transformed into a single God. Now some people depend on God for everything. That is why they try to introduce the idea of an eternal soul that departs from here and remains in heaven eternally. That is to satisfy the craving for existence forever. The Buddha says anything that comes into existence is subjected to change, decay and extinction. “In that case,” he asked, “can you tell me what Buddhists do?” I told him, the Buddha has given the answer to that question, Buddha has advised us what to do. Instead of believing, one must practice pariyatti, patipatti and pativeda. There are three ways to practice. First we must try to understand because we must not blindly believe anything that we cannot understand. The Buddha says you must first try to understand. In his teachings of the Eight Fold Noble Path, the first item is sammaditthi, right understanding. Buddha started his mission by asking his followers to develop right understanding rather than blind faith or belief. After learning we gain wonderful knowledge about Buddha and his teachings. You have to practice what you have learned. If you have not understood this, then you will create ideas according to your own imagination. His advice was to practice what you have learned with understanding. After practicing you experience the result or the effect. Then you come to know that it is true. These are the three methods that the Buddha taught, to learn, to understand, to practice. This is the way to live in this world to get rid of our suffering. Now you can understand that the Buddha’s way of introducing religion was not by asking us to believe anything but to learn, practice and experience the results. For instance, the Buddha says that you must be kind, you must be honest. After understanding the teaching, you try to practice it and after that everybody respects you when they come to know you’re very kind, very honest. Nobody wants to disturb you or accuse you, but they respect you. That is the good result that you experience. At the same time the Buddha says you must try to understand according to the level of your own experience. You can test the results of the practice yourself. You understand why some things are wrong and why some things are right and you do not follow them because the order or commandment comes from heaven. You have a thinking mind and common sense to understand. Our understanding and our own experience is enough to understand why something is wrong or right. For example the Buddha advised us not to destroy other living beings. He did not introduce this as a religious law because an understanding human being should know that killing is cruel. It is not difficult for us to understand why it is bad because when another person comes and tries to kill us we certainly do not like it. Again he says when you have valuable things stolen by somebody, how would you feel? In the same way when we steal others’ property they also do not like it. It is not necessary for us to get orders from any god or Buddha or Jesus to understand this simple concept. Religious teachers appear in the world to remind us what we have neglected or forgotten. Your own experience and understanding is more than enough for you to know why certain things are right or wrong. The Buddha advised us to think and understand. We have the sense of reasoning. We have common sense unlike other living beings which also have a mind but cannot think rationally. Their minds are limited to find food, shelter, protection and sensual pleasure. They cannot extend their mind further. But human beings have a mind to think and understand up to the maximum level. This is why scientists have explored and discovered many things which we never heard of before. There is no other living being in this world which can develop the mind up to that extent. That is why only a human being can become a Buddha. Only by developing their minds can human beings gain enlightenment. The Buddha told us, to act according to our own experience. Then we can experience the results. The followers of all the other religions, greet others, saying “God bless you”, but Buddhists very seldom greet others, saying Buddha bless you. But they recite “Buddham Saranam Gacchami” (I go to the Buddha for my refuge). If they believe that they can take refuge in the Buddha why they do not greet others saying “The Buddha Bless You”. Buddha also advised people to remember the Buddha when they have fear. So “Where is the Buddha” is our topic. Can we say he is in heaven or he is living in nirvana or he is living somewhere else? Where did he go? We must remember that everything we ask is from a worldly point of view. After gaining enlightenment Buddha said “avamantimaiati natthidani Dunabavo”, this is my last birth and there is no more becoming again. I have already stopped becoming again and again in this world, life after life, and experiencing endless suffering. Pleasure or entertainments that people experience are temporary emotional satisfactions that disappear within a short period. This creates unsatisfactoriness. Within a lifetime physically and mentally we experience enormous suffering, worries, problems, pain, difficulties, calamities and unsatisfactoriness. There is nobody in this world who can say that he is satisfied with this life. Everybody complains and grumbles about physical or mental problems. By understanding this situation the Buddha stopped rebirth. That is called salvation. Salvation means freedom from physical and mental suffering. By existing in physical form or any other form we cannot overcome our physical and mental suffering. Therefore if we don’t like to suffer, the best thing is to stop this birth. We crave for existence. This craving and attachment are very strong in our mind. But we want to exist in spite of all these sufferings and troubles, pain and sicknesses and many other problems because of our craving and ignorance. Now look at what is happening in this world. The whole world is a battle field. All over the world people create violence and bloodshed and war and destruction. Animals are living without creating many of all those unnecessary problems to suffer. When they are hungry they go out and catch another living being, satisfy their hunger and go to sleep. But human beings cannot be satisfied without craving for so many other things. Craving, attachment are so strong in our human mind. Because of that jealousy, enmity, anger, ill-will, cruelty and wickedness arises. Other living beings do not develop their cruelty up to that extent. Human beings have a religion. Religion is not only to worship and pray but to do some service to other living beings by keeping away some bad thoughts so that we can serve others. Devotional aspects of religion are important but that alone cannot develop the mind to gain proper understanding or wisdom. Before the passing away of the Buddha many people assembled with flowers to offer and pay respect to him. The Buddha asked them to go back. He said if they really wanted to respect him, instead of offering flowers, and worshipping, they should practice at least one of the advices given by him. Then they really respect the Buddha. Now you can understand what the Buddha wanted. A religious way of life is not only to pray but to follow some advice given by him. Once a monk called Bakkula would come and sit down in front of the Buddha and watch him everyday. One day the Buddha asked him “what are you doing here?” He said, “When I look at your physical body, it gives me a lot of happiness.” Then the Buddha said, “Bakkula, by watching this dirty, filthy, impermanent physical body what do you gain? You only entertain your emotion. You never gain knowledge or understanding but entertain your emotion. You cannot see the real Buddha through the physical body. Buddha is not the physical body.” Then he said, “Only one who understands the dhamma taught by the Buddha sees the real Buddha. The real Buddha appears in the mind when we understand what the Buddha taught. Here you can understand the Buddha was not particular about the physical body. When you study the history of India, for nearly 500 years there never was any Buddha image because the Buddha did not encourage anybody to erect images of Himself. It is the Greeks who created the Buddha images and other forms of religious symbols. Now of course different forms of Buddha images have spread all over the world. Maras are not living beings but strong mental obstructions and hindrances which prevent one from leading a religious way of life. Mara is then personified as the Evil One. This Mara started to perform very attractive entertainment, dancing, singing and merry making in front of the temple. Then the devotees slowly turned to watch Mara. Nobody came and listened to his talk. Upagutha decided to teach Mara a good lesson and he also went to watch the performance. When the performance was ended Upagutha said he really appreciated it. “In appreciation of your performance I would like to put a garland on your neck.” Mara was very proud. When Upagutha put a garland he felt the garland tightening around his neck like a python. He tried to pull it out but could not. Then he went to Shakra, the king of the gods and asked him for help to remove the garland. Shakra also tried his best but he also could not take it out. Then he went to Brahma who was regarded as creator god at that time and asked him to remove the garland. He also tried to take it out but could not take it out. Then Brahma told him that only the one who put it on could remove it. Anatole France who was a French scholar, visited London Museum and for the first time in his life he saw a Buddha image. Having seen this Buddha image, he said, “If god has come down from heaven to this earth he is none other than this figure.” However an image is not essential. There are many who can practice the teaching of the Buddha without any image. It is not compulsory that they must have an image. We don’t worship, we don’t pray, we don’t ask anything from the image but we pay homage, we respect this image of a great religious man. One of our members had been keeping a Buddha image for 45 years in his house. One day some missionaries came and told him that he was worshipping the devil. He did not know how to reply to them. This is surprising because for 45 years he had been worshipping the image and he did not know what to say when people condemned it. This is the weakness of some of our Buddhists. They follow tradition, worshipping, praying, offering, chanting but they do not try to understand the teachings of the Buddha. Now you can understand with or without the Buddha image you can practice the teachings of the Buddha, because the physical body is not the Buddha. The Buddha has mentioned “whether the Buddha appears or not dharma exists forever in this world”. When a Buddha appears he realizes people have forgotten the real dharma. “This dharma that I understood is not a new dharma created by me”, said the Buddha. “This dharma has always existed but people have misinterpreted, created wrong concept according to their own imagination and completely polluted the purity of the dharma”. It is even happening today 2500 years after the Buddha revealed the truth as dharma. People are doing wrong things in many countries in the name of the Buddha. It is not that they really follow the advice given by the Buddha. But they introduce their traditional cultural practices mixed with Buddhism and introduce it as Buddhism. As Buddhists, we must try to learn what the Buddha taught and try to practice what the Buddha taught to seek our salvation. People ask where the Buddha is. To practice Buddhism it is not necessary for us to know where the Buddha is, or where he went. Take for instance we have electricity discovered by somebody. Is it necessary for us to know the person who discovered electricity, where he is and from which country he came and his name? Our duty is to make use of the electricity. Again those who have discovered atoms or atomic energy can use this atomic energy for constructive or destructive purposes. So it is our duty to make use of this energy in a proper manner. It is not necessary to know actually who discovered this atomic energy. People have discovered the computer and television but it is not necessary for us to know the names and the details of them, our duty is to use them. In the same manner do not ask where the Buddha is, or where he went. If the dharma, what he taught, is true, available and effective why is it necessary to know where the Buddha is. The Buddha never said that he can send us to heaven or hell. The Buddha can tell you what to do and what not to do to gain our salvation. That is the only thing Buddha can do. He cannot do anything for you. Your duty is to practice what the Buddha taught us. Others say that god can wash away the sins committed by people. Buddha never said that sin is created by one person, and it can be washed away by another person. Neither Buddha nor god can do that. When a person is going to die and says that he believes in god, after all the sinful things that he committed can god take away his sins? For instance maybe you are very hot tempered and you know it is wrong but you do not know how to get rid of it. So you go to god and pray and ask him to please take away the cruelty from your mind, do you think any god can do that? You may go and worship the Buddha and ask the Buddha to take away your cruelty. But the Buddha also cannot take it away from your mind. The Buddha can only tell you how to remove your anger with your own effort. No one can help you but yourself through your understanding. You yourself must realize, “this anger is dangerous, can create lots of trouble, problems and difficulties and harm and disturb others. I must try to reduce anger by using my mental energy and create strong determination to withdraw anger from the mind.” So the Buddha or God cannot wash away sins created by us but we alone can do that. There is a good advice given by the Buddha. If anyone has committed a bad deed or bad karma, they cannot get rid of the effects by praying to god or Buddha. However when they come to know that they have committed the bad deeds then they must stop committing bad deeds again. You must create strong determination in the mind to create more and more good karma or meritorious deeds. When you develop your meritorious deeds, the effect of the bad karma that you have committed earlier can be overcome by good karma. Take for instance Angulimala, the murderer who killed nearly one thousand human beings. When the Buddha came to know that he went to see him. Angulimala wanted to kill the Buddha because he had completed 999 murders. His vow was to kill the thousandth, so he was very happy when he saw the Buddha and tried to catch him. Occasionally the Buddha performed a little miracle. Knowing it was difficult to control this man by preaching, the Buddha walked in a normal way and allowed him to run. Although he ran nearly 4 miles, he could not come near to the Buddha. Then he asked the Buddha to stop and the Buddha knew it was time for him to talk to him. The Buddha said “I have already stopped, you’re the one who run.” Angulimala said, “how can you say you have stopped, I saw you walking.”The Buddha replied, “I have stopped means I have stopped killing or destroying other living beings. You are the one who is running means you are still committing evil. If you stop running then you can catch me.” Then Angulimala said “I cannot understand what you said.” Then the Buddha said “I have stopped killing and you’re doing just that, that is the meaning of running. You are running in samsara.” Then Angulimala came to know that he was wrong and decided to follow the Buddha and he became a monk and started to meditate. Later he attained arahantahood and gained nirvanic bliss. Bad karma had no chance to come to catch him. He went on developing good karma and the bad karma had no chance to affect him. That is what the Buddha said. The Buddha taught this method to overcome the effect of bad karma not by praying to any god but by doing more and more meritorious deeds. If I say that the Buddha is living in any part of the universe in physical form it is against the teachings of the Buddha. On the other hand if I say that the Buddha is not living in any part of the universe in physical form many people are not very happy because they have craving for existence which cannot be satisfied. Therefore they say it is nothingness. It is not nothingness; it is the ending of physical and mental suffering and experiencing nirvanic bliss or salvation. On the other hand there are some people who really need the physical form of the image of the Buddha to calm their mind, reduce their tension and fear and worries. However it is not right for us to say the Buddha is living or not. If the doctrine or the teaching of the Buddha is available for us to experience peace, satisfaction in our life that is more than enough for us. Let us take a doctor who has discovered a very effective medicine. If the medicine is available, if it can cure sicknesses, is it necessary for us to know where this doctor is and whether he is still living or not? The important thing is to get rid of our sicknesses by taking the medicine. In the same manner the teachings of the Buddha are more than enough for us to get rid of our sufferings. The Buddha has given us the right to think freely to understand whether something is wrong by using our common sense or reasoning for us to understand the real nature of things that come into existence. 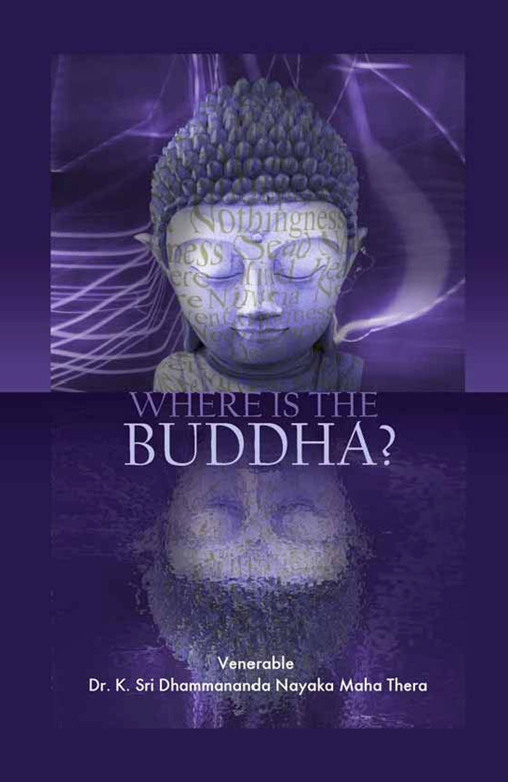 Many people ask where did the Buddha go? If people say he has gone to nirvana then they think nirvana is a place. Nirvana is not a place, it is a mental state for us to achieve to experience our final salvation. We cannot say the Buddha has gone somewhere or Buddha is existing but he experiences the nirvanic bliss or the final goal in life. So the best answer to the question “Where is the Buddha?” is the Buddha is in your mind which has realised the Ultimate Truth. This book may be reproduced in whole “as it is”, whether in print or through electronic means, recording or other as long as it freely distributed at no charge. Venerable Dr K Sri Dhammananda nayka Maha Thera was involved in Buddhist missionary work for 54 years. He was born in Sri Lanka on March 18, 1919. When he was 12, he was ordained as a novice monk and given the name Dhammananda meaning “Bliss of the Dhamma” as well as the first name Kirinde after his village. At 26, he graduated from the Vidyalankara Pirivena College in Colombo with a Diploma in Pali and Sanskrit, Buddhist philosophy and the Pali Cannon. He continued post-graduate studies at the Benares Hindu University in North India for four years and graduated with a Masters degree in Indian Philosophy in 1949. In 1952, he was invited to Malaya to reside at the Buddhist Vihara in Brickfields, Kuala Lumpur to teach Buddhism. In 1962, he established the Buddhist Missionary Society (BMS) for a more organised missionary work in the country. Under BMS, he wrote many booklets and books on Buddhist teachings. To-date, he had written 70 books, which have been translated into no less than 16 languages worldwide. In 1965, Ven. Dhammananda was appointed the Chief Monk of Malaysia and Singapore. He passed away at the age of 87 on August 31, 2006, Malaysia’s Independence Day in Kuala Lumpur.